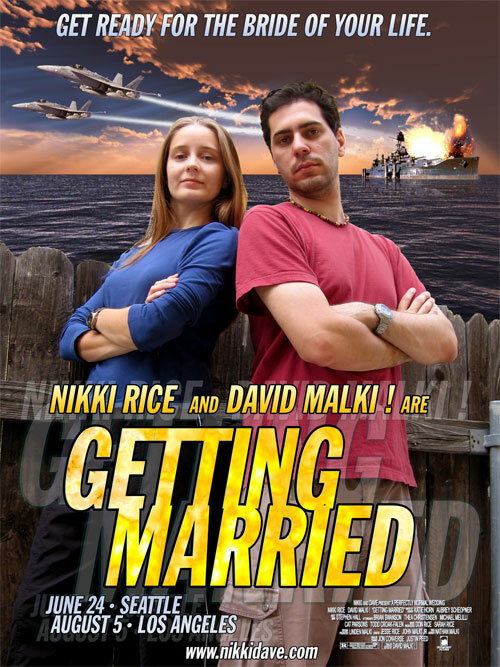 Nikki Rice & David Malki ! If you would like to click on some links, here are some links. David is a writer, filmmaker, and comic creator. The best way to stay informed about his various goings-on is via his comic strip website, wondermark.com. It is updated twice every week with goodness. He also creates original consumer products which are rather popular. Nikki is a photographer, special-effects make-up artist, and modelmaker. She has an online gallery. You can hire her to take pictures of you, or make you look like a monster, or both. David used to be a movie trailer editor. Here are some pictures from Nikki & Dave's wedding and honeymoon if you would like to take a look. But no one's forcing you or anything. If you haven't seen it, you should really watch their wedding trailer. And if you are really that interested, here is a (fairly) complete bibliography of David's creative work online. He also wrote an article about how to break into the movie trailer editing industry, which by now is probably wildly out of date and inaccurate. this is a website containing information about nikki rice and david malki !